Whether you are building a new pool or updating an existing pool deck, there are numerous options to choose from when creating your ideal area to relax. 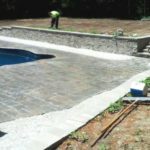 Our expert hardscape artisans focus on installing pool decks constructed from concrete pavers and natural stone. 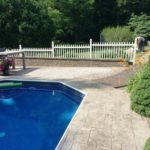 A pool deck of concrete or stone pavers will provide you with a pool deck that is beautiful, while being extremely durable and non-slip. 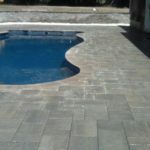 When using pavers, we can create everything from simple layouts to intricate patterns and styles. 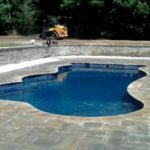 When most pools are installed a pool deck of poured concrete or stamped concrete is chosen for ease of installation and price. It is inevitable that over time, these options will crack and heave and require extensive repair or replacement. Pavers eliminate this issue because if one breaks it can simply be pulled up individually and replaced or re-leveled if the ground underneath settles. If you every have an issue with plumbing under your pool deck or want to add a structure, they can be pulled up and relayed when the work is done. What is the process for installing my new pool deck? If you have an existing pool, an onsite consultation will determine what needs to be removed and we can work with you to design your new pool deck. Now is the perfect time to expand your pool deck into an outdoor living space as well. 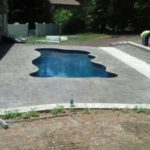 After you have decided on a design and materials we can install your new pool deck. We will need to remove your existing pool deck and dispose of it. 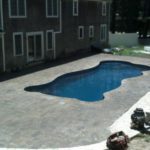 After preparing the base properly and making sure that there are no issues a pool company needs to address, we can install your new pool deck. 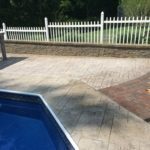 What are my options for pool deck protection/ coatings? When installing a paver pool deck, using a sealer is a great way to keep your pavers looking like new and to protect against everyday stains. A non-glossy sealer will keep the surface non-slip while enhancing the colors of your pavers. 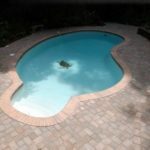 If you’re planning a new pool installation, involving us from the beginning will save you money and time. 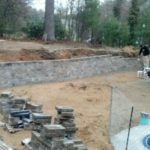 From experience, planning out the pool deck and the surrounding outdoor living space before the pool is installed will ensure that the project goes smoothly and you get the most for your money. 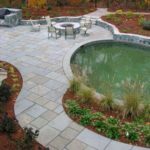 Contact Sheridan Landscaping for a free estimate on our pool deck designs and installation at (774) 413-5012 or fill our contact form to get immediate assistance.